"Welcome to our Scavenger Hunt Ideas page where you'll find lots of fun scavenger hunt party themes, scavenger hunt clues, riddles, lists, rules and much more..."
What IS a "Scavenger Hunt" Party? Scavenger hunts are fun and challenging task-based games which involve two or more small teams competing against each other to complete a list of set tasks within a given time period. All the teams have an identical list of tasks to perform, together with a set of rules they must follow to ensure they know what they need to do and what they're not allowed to do. Points are awarded to each team for each completed task, but can also be deducted for certain things, like finishing the scavenger hunt after the deadline has passed or breaking one of the rules. You can have a lot of fun creating your own 'points system' and can include 'bonus' points for bringing humor and creativity into each team task. This works particularly well if you are having a scavenger hunt where each task is captured on photos or video. You could for example, have a point system that awards the teams 2 points for completing the task, 4 points if the task was completed and was funny or creative in some way and 6 points if the task was exceptionally funny or creative. Get the 'unbiased' parents to award these points at the end of the hunt when the pictures and videos are reviewed. Although the team to finish the hunt with the most points receives the 'winners prize', you can have fun awarding prizes for just about any aspect of the hunt - for the first to find a particular item, the first to solve a specific riddle or clue, the team with the funniest photo or video, the best team song performed in public...and so on. When it comes to deciding on a scavenger hunt theme for your own scavenger hunt party, there are lots to choose from and even more that you can create yourself. Scavenger hunts can follow a specific theme - e.g. a Nature Scavenger Hunt, or can be a combination of specific scavenger hunt themes, type of hunt (e.g. Photo), location (e.g.neighborhood), setting (park) or even around a certain date or holiday. You could for example create a Mall scavenger hunt theme based around a specific Color, where the teams are tasked with taking Photos or Video of team members trying on certain items of that color. A combined Alphabet and Neighborhood hunt where the kids have to find an item from each letter of the alphabet in the neighborhood and have to Describe in Words each item. A combined Beach and Nature scavenger hunt to find and Draw items with a certain characteristic - Texture (smooth, sharp, rough, transparent, etc. ), Size, Color, etc. A Circus and Mall theme scavenger hunt where the kids have to Video each other 'clowning around' wearing certain items - singing and doing certain team circus tricks in public. You'll find a growing list of free scavenger hunt ideas for parties and themes below, each of which are packed with free scavenger hunt party invitations, thank you cards and free scavenger hunt ideas to match the scavenger hunt party theme. "Say Cheese! "...Photo Scavenger Hunt parties are a real blast and you'll find tons of scavenger hunt ideas, free invites and thank you cards on this page to help make planning your own photo scavenger hunt party a real 'snap'! How many children will there be at your scavenger hunt party? - the more children there are, the more teams you'll need and the more adults you'll need to help organize and chaperone the kids. Having lots of teams running around trying to complete the same tasks at the same time can also be a little chaotic for some scavenger hunt themes, so try to limit the numbers or stagger the tasks so that the teams are doing different tasks at different times. What's the age range of the children taking part? - The younger your party guests, the simpler the tasks, clues and scavenger hunt theme will need to be. You'll also need to consider how long to run the scavenger hunt for. Try and aim for around 1 hour for the youngest kids aged 6 to 8 years old, to as much as 4 hours for energetic teenagers! What's a suitable scavenger hunt theme given their ages and the time available for the party? 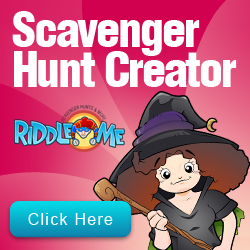 - Older kids will enjoy the challenge of more difficult riddles, clues and tasks and it'll be easier to organize outdoor hunts that can include videoing, taking photos and interacting with strangers (e.g. asking a stranger to help them with a task). Once you've decided on your scavenger hunt theme, the next step is to create your scavenger hunt list - the best way to do this is to walk around the location you've chosen and create your list from items that you see and tasks that could be completed there. To help give you some inspiration, you'll find lots of free scavenger hunt ideas and lists on our scavenger hunt list ideas page and on each of our scavenger hunt themes' pages. If you're planning for the kids to eat at the hunt location, make sure you book any services or facilities in advance (e.g. places in the food court or a restaurant) and agree on any special arrangements with the proprietor. Make sure you've got the birthday cake covered too and if you're bringing your own, have a helper on hand to fetch it from your car while you are with the kids. Make sure the kids are suitably dressed for the scavenger hunt and will be comfortable in what they're wearing. Unless the kids are all teenagers and able to act responsibly, it's a good idea to have an adult on each team to chaperone the kids and make sure everything goes safely and smoothly. If the scavenger hunt is going to be held outdoors and will last several hours, make sure the kids have some snacks and drinks with them to keep them hydrated and their energy levels up! Make sure you're aware of any specific health or dietary requirements any of the kids may have - for example if any of the kids have specific allergies, are diabetic or suffer from asthma etc.- and make sure the accompanying adult is aware, has whatever medication or food that is required and knows what to do in case of an emergency. Divide the kids into teams, making sure to have a mix of ages in each team, particularly if there is a wide age-range in the whole group. Make sure you consider other factors too, such as the number of kids that can fit into a car if they're to be driven around by an adult as part of the hunt. In any event it's best to aim for smaller groups of 3-6 kids so that they're easier to manage and so that each team member gets to be actively involved in the tasks. Have some fun by handing out 'team colors' to differentiate between the teams - colored hats, caps, T-Shirts, bandanas or scarves are all great for adding a dash of color and making the kids easy to spot. It also makes it easier to refer to the teams if they are called 'Pink Team', 'Blue Team', etc. Give each team their scavenger hunt list and make sure each has the 'tools' they need to complete the hunt - the list of rules, pens, pencils, notepad, compass, map of the area or mall, bags, digital or video camera, etc. Make sure also that each group has a phone with the contact number and home address just in case and that all phones and camera's are fully charged before the teams set off. Set the deadline for the scavenger hunt - usually one to four hours from the start works best), then, when everyone is ready...start the count-down ...3....2...1...GO! You'll have lots of fun creating your own scavenger hunt clues for the kids to solve and scavenger hunt lists of items for them to hunt and tasks for them to complete. You can find lots of free scavenger hunt ideas to help with both your clues and building your list on our scavenger hunt clues page and on the scavenger hunt list ideas page. You'll also find free scavenger hunt ideas for lists and clues in each of the scavenger hunt themes above. To ensure that the kids are safe while they're out and about playing their scavenger hunt game and that they have a ton of fun, it's important to set some boundaries and start off with a clear set of rules - the "Do's" and "Don'ts!". Here's some free scavenger hunt ideas and sample scavenger hunt rules to help get you started creating your own rules - just adapt them to fit your location, theme and age group of the kids. Maybe you've got a great idea for a scavenger hunt birthday cake or party invitation or a fun scavenger hunt party activity or game idea? Maybe you've created some special scavenger hunt party accessories or decorations that you´d like to share to help inspire other parents? If so, we'd ALL love to hear from you! Please take a moment to add your own scavenger hunt birthday party idea.